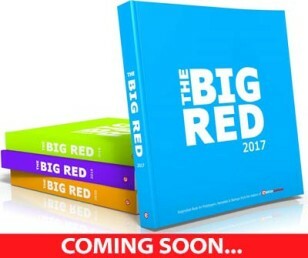 Aptly titled ‘Big Red’, Elektor’s yearbook will be published for the first time in December 2016. The Big Red should be considered as an annual publication with highlights both exploring the recent past and taking a step into the near future. JOIN US: Do you want to contribute to this new inspiring book?! Covering the complete spectrum of electronics, it will bring to you the passionate stories engineers and entrepreneurs are so eager to voice. The Big Red aims at being an annual reference for everything electronics showing spirit and sparks. Which are the topics the Big Red is going to explore? Elektor is not into crystal balls ... Still, it’s exciting to cast a forward eye, say, to the coming ten years. The keyword here is anticipation, the mother of creation. If we can somehow mobilize our knowledge by a glimpse of the not too distant future, we should do so. No way the days of the Two Steves (Jobs & Wozniak) are over. Startups abound, whether they begin as a ‘homelab’, at University or Highschool, or in a derelict industrial building. Elektor encounters e-spireted people everywhere. If we can contribute to their cause, we will. By letting them speak, for example, spirited and sparking, in the Big Red. Most startups have the knowhow and they have the determination to succeed. But, although very important, this combination of competence and motivation is by itself not enough to create a successful business. There has to be cash before you can even contemplate cashflow. Where and how do you raise capital to present yourself to the outside world? Is there a Business Angel around? Is crowdfunding an option? This section of the Big Red explores the fittest opportunities. Where do you want to start? 3D Printing, low energy pursuits, the Internet of Things, medical monitoring, LEDs? Basically, it doesn’t matter. You’ll find them all here, in this section. We tell you the basics. This part of the book can act to extend your knowledge base. Everything you need to know in 2017 (and even beyond) is here, handpicked by a specialized team of Elektor editors. (+) Company Pages — may I have your attention please! Suppose you are a company in electronics and you can offer a solid product or service. Suppose you have overcome technical hitches and take pride in your technical achievements. Suppose you know that you do not have any time to lose. Suppose you’d appreciate some help to get your message across in the shortest timeframe possible, and peak with a ‘buzz’ around your product. Not supposing any longer, a Company Page is the ticket. Are you looking to have the right people in the right positions? In terms of electronics, this was and is a real challenge. Now, Elektor steps in to help with Elektor Talents. With Elektor Talents, we can present your company in an authentic and edifying way, enabling the candidate to catch the look and feel of your enterprise. Why not look for talents in a completely new way, with your unique goodwill as your asset? The section ‘Companies in Red’ offers you a broad overview of nationwide and internationally listed companies and institutions, categorized by precisely your line of business. Remember the Commodore C64? Did you build that 80-column graphics card yourself? Or were you saving for a PC clone and a CRT monitor with green or amber characters? Those were lively days. Sir Clive Sinclair wanted to push the Quantum Leap to the business market also. But his QL never managed to match the attention his ZX81 and Spectrum got. It is worthwhile to collect some memories from the good old days — just for the fun of it. Our editors are keen to showcase what they consider to be the right blend of innovative developments and established technologies. Valuable information for decision makers is what they are after. You too can be in the electronics almanac. Grab the opportunity, actively contribute to one or more of the topics the Big Red is sure to explore.